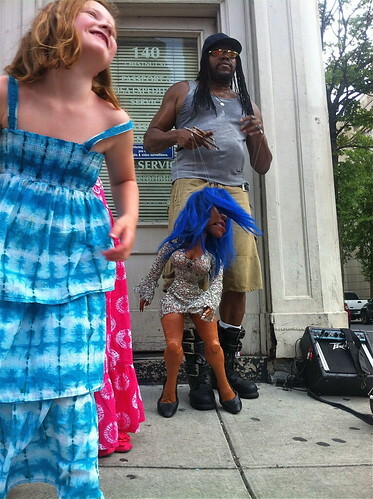 Frank Moore, a tall muscular man, pulls on the strings of a 2-foot tall high Tina Turner-esque puppet; it lip-syncs and dances to funky music blaring from his boom box in eerie mimicry with his arm and torso motions. Moore and “Tina” (he doesn’t give his puppets names) reeled in passersby at a corner in Old City one evening in downtown Philadelphia. Moore makes his own puppets, and this year’s bunch are ones he has revamped from last year. During the school year he performs at parties. But because practices always go so smoothly at home, during the summer he works the kinks out of his routines in different public spots around the city. This was Tina’s first time out and she was not doing well, Moore joked. In addition to Tina, his current cast includes a young boy, an old man and four others, all siblings, he says. They bear resemblances to each other but dance to different international grooves - German, Korean, Hindi, Chinese, Japanese. Two young girls passing by were visibly intrigued by Moore’s act. Giggling, they hesitantly approached the puppeteer, hanging on to each other for support. Then one dashed forward and stuffed a bill in Moore’s donation bowl. Tina was not putting on too shabby a show after all. 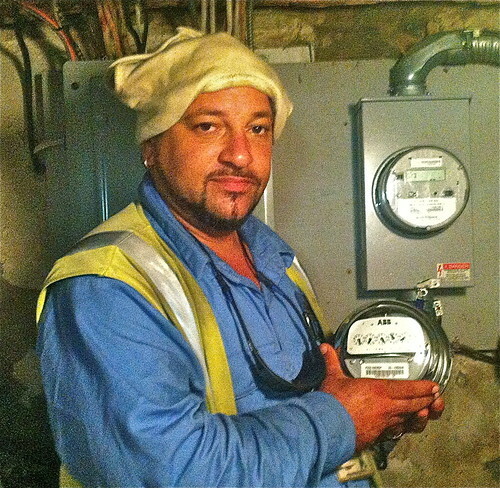 PECO is replacing the existing electric meters in the neighborhood with new remote controlled smart meters using Radio Frequency (RF) transmission. Installer Peter Paige stopped by one morning, as scheduled, to make the 15 to 20 minute switch-out. This is the process: Wearing fire resistant clothing, Paige first dons personal protective equipment: a hood, helmet and goggles to guard against a flash which might occur should he touch a live spot inside the box. He credits the protective gear with saving him on more than one occasion! Paige then records the old meter number and reading and the new meter number and reading on a multifunctional, handheld electronic device. Then pulling off the old meter, the lights in our utility room and house go out. With a helmet-mounted lamp lighting the box, he tests the voltage. Trilling sounds indicate it’s OK. He snaps in the new meter and attaches a seal; its thin gauge wire can be cut but if it is discovered so, will indicate tampering. With the handheld, Paige then takes photos of the old meter. Melting, burning or char on the plastic back of the old meter will indicate an electrical problem that a special PECO team will follow up on. And lastly he beams a red light at the meter to activate it. And it’s on to the next job. Paige says his appointment team can do up to 15 or 20 or more on a good day. The smart meter allows PECO to turn it off in case of either emergency or delinquency. The new meter also has a sensor that detects overheating, surges or other improper conditions, can signal PECO and can shut itself down. Soon, a website will be available for customers to monitor and analyze their electric usage and achieve savings. A “New Metering Technology” handout Paige provides explains that the new meters are being installed in accordance with the requirements of Pennsylvania Act 129 of 2008. In addition to the quick detection and correction of problems, the new technology is expected to provide the basis for new products and services. The handout also addresses consumer concerns about the level of Radio Frequency (RF) emitted by the meter and potential concerns about the privacy and security of the information captured. Watch video of interview and installation here. 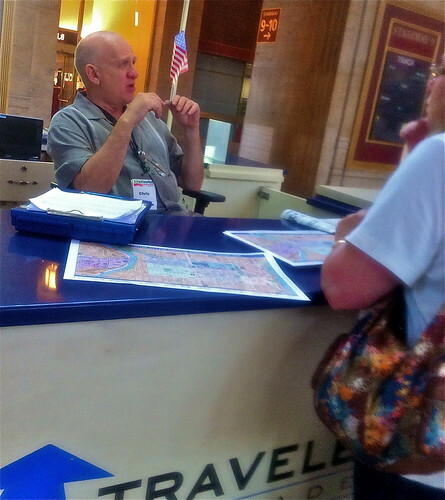 “When certain events take place like this festival of Hidden City or different things like that. I don’t know if you’re part of Occupy but it tends to bring people out of the woodwork and put them in a certain space where they can share their talents and creativity. And my experience with these types of things is that it lends itself to a tremendous new and refreshing hope for mankind, for the state of affairs in the world. Because the tendency is to think we are all alone in our own head and even if we do come up with some positive ideas on what to do we feel pretty helpless because what can I do by myself. When different things happen and people come together, we stand to get a tremendous new inspiration. And actually, ‘I can do something, I do count and there’s other people that think the same as I do.’ If we put our talents and our efforts together we can really make some difference. I’m a yoga instructor. I teach yoga meditation and music is a big part of what I do. Because music and something that’s called Kirtan, sankirtan which means the congregation and glorification of the supreme joy of life. So basically, just like your drumming circle, same type of principal. People come together and they selflessly express themselves in such a way that the overall effect is that everyone feels a tremendous upliftment the environment becomes uplifted the community, neighborhood, like that. Just imagine if we could have this on a worldwide scale, every day then the whole planet the whole, the karmic pattern of the whole planet earth will be changed, will be uplifted. 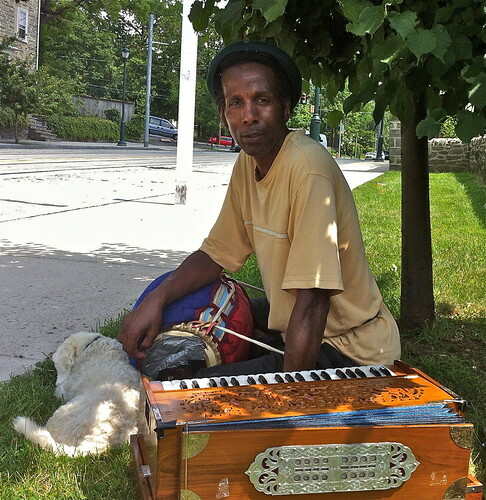 Watch video and harmonium playing here. 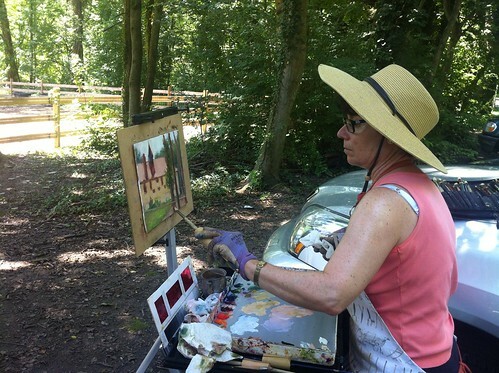 Frances Galante, an art instructor with the Woodmere Art Museum, has been bringing her Plein Air painting students to Northwestern Avenue at the edge of Wissahickon Park – to paint in the open air, of course. On a recent morning she was seen giving tips to student Maria Kurtzman, who was painting the horse barn. on how to put back in the shadows of the cupola that were visible when the sun was lower in the sky. In addition to making a mental memory of the scene, Galante says, a drawing or a digital camera shot are other tools that can be used to meet the landscape painting challenge of changing objects in the scene and shifting light. For student Anne Rothman, Galante suggested more specificity. Watch video here. 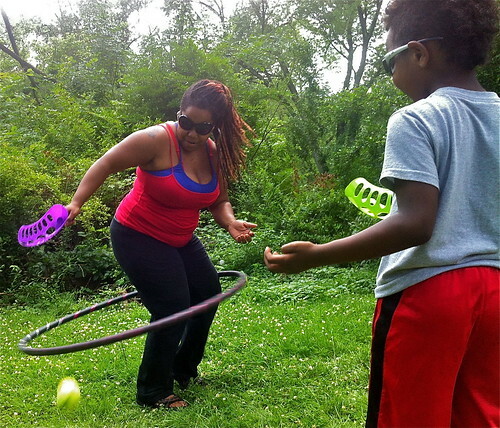 Vanessa Hazzard-Tillman teaches hula hooping in East Falls, entertains at parties and at the Public Eye: Artists Animals July 4th Vegan Potluck picnic in Harper’s Meadow in Chestnut Hill, she showed off some of her stuff. A former clown and currently involved with the vibrant Philadelphia circus arts community, Hazzard-Tillman is also a massage therapist and yoga instructor. She especially likes to combine yoga and hooping. While being distracted by her young son, Phoenix, she nevertheless managed to twirl a hoop smoothly around one rotating foot in the air while switching from one yoga pose lying on the ground on her side to an inverted pose. Hooping is good for muscle toning, she explains while demonstrating some “off-body” exercises that can be easier than “on-body” exercises. Hazzard-Tillman often studies online videos and is now training to do fire hooping. The circus community likes to give back, she says, introducing one of her ambitions. In addition to being President of the United States and a rock star according to her online profile, she hopes to successfully audition with a troupe that instructs youngsters in circus arts in one of the refugee camps in northern Thailand. The two-month program in which the children learn juggling, clowning, poi spinning, silks and hooping culminates with the refugee children mounting their own performance. Hazzard-Tillman makes her own hoops out of black polyethylene tubing, covers them fun tape like Batman or Hello Kitty themed patterns and also sells them online through Amazon and her own website nirvanalandessentials.com where she also sells jewelry, gemstones and African soap. Her business card also lists her profession as “Reiki Master/Teacher.” Had my interview with her continued further, I definitely would have asked how she manages to juggle it all!